If you're the kind of person who lives for the command line or Run box, you'll want to download Advanced Run right now. It's a free program launcher that lets you quickly launch programs and commands and to automate routine actions, such as cleaning up your hard disk or comparing two files. Press the Ctrl-R key, and the program pops up. 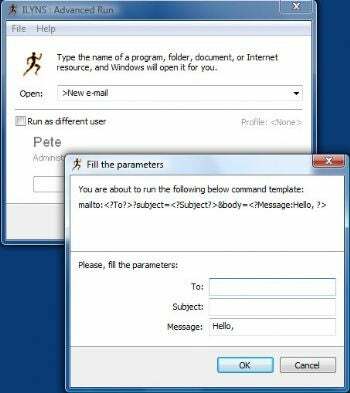 Then type in the name of the command or action you want to perform, or folder, document or Web resource you want to open, and the program does it for you. Making it even easier is that it comes preconfigured with commands for many tasks, including creating e-mails, comparing files, running programs and services, and more. If for some reason you use different user accounts for different purposes, Advanced Run lets you run a command for an account different from the one in which you're currently logged on. It also has lots of customization features that makes it easy to launch very complicated commands. If you don't use the command line or Run box much, you won't want this program. But if you do use them, Advanced Run may make your life immensely easier.